// SiON ver0.6x's new concept "SoundObject"
// SoundObjects are SiON-based software instruments which brings an operational feeling of DisplayObject. // Synthesizers are wrapper classes of SiONVoice. // This provides more direct, easier controls of SiON's voice. // Effectors are from SiON's effector package. // SoundObject.effectors property or SiDriver.effector.slot* property has a similar operation of "DisplayObject.filters". // Even using SoundObject, you have to create new SiONDriver and call play() method. // In current version(0.60), you have to create new effectors after SiONDriver creation. // Set up general parameters (BPM, effect and so on) by SiONDriver's property. // The Arpeggiator is a monophonic sequencer plays arpeggio pattern specifyed by int Array. // These effect send level calculations porvides MIDI's effect send feelings (but not perfectly same). // In this sample, the wave table synthesizer is applied to Arpeggiator. 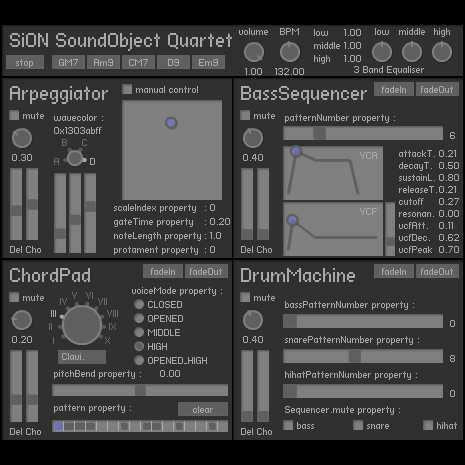 // The wave table synthesizer provides simple additive synthesis by SiON's "wavecolor". Or you can edit wave shape directly. // The BassSequencer is a monophonic sequencer select bass line pattern by number. You can also apply orignal pattern. // In this sample, the analog-like synthesizer is applied to BassSequencer. // The analog-like synth provide controls by "analog synthesizer like" parameters. // The ChordPad is a polyphonic sequencer plays a rhythm pattern which lengthes are specifyed by int Array. // The number of voices (1~6) should be specifyed in constructor. The default number of voices is 3. // In this sample, preset voice loader is applied to ChordPad. // The preset voice loader provides simple voice number access to SiONPresetVoice. padVoiceLoader = new PresetVoiceLoader("svmidi"); // load voice categoly "svmidi"
// The DrumMachine is a 3 tracks sequencer plays drum patterns specifyed by independent number for each bass, snare and hihat. // In this sample, we use default voices of DrumMachine. You can also apply any voices for each track. // All DrumMachine's default voices are 1 operator voice, so you can play very light-weighted rhythm track. // Even using SoundObject, you have to call SiONDriver.play() method to start SiON's sound streaming. // so we pass false in the 2nd argument to avoid initializing effector inside. // The SoundObject starts playing sound by play() method and stop it by stop() method. // In current version (0.60), you have to stop all SoundObjects explicitly when the SiON's stream stopped. // In the future version, it may stop automatically. Sorry for the inconvenience. // So, what shall we do here ? // So, what shall we do here ??? // Specify chord and scale name for each instrument except for DrumMachine. // Sorry, there are extremely few comments in the following code. // You may search some hints with the keywords of "Ar. ", "Bs. ", "Cp." and "Dm.". // And if you are interested in customized Component, please search by "custom". // custom component "Knob_" is a small knob.